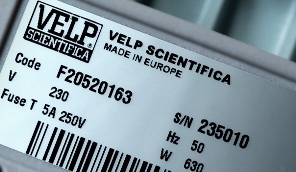 VELP provides many laboratory instruments and solutions, able to improve your productivity and simplify your daily activities. Evaluate the solubility in water of pollutants present in sludge, sediments and solid waste. Heating circulation is extremely important when facing sample preparation or pre-analysis treatments, temperature control or thermostating, academic and material testing. It is extremely important to use a solution that is heated up homogeneously and accurately, in order to ensure the same conditions are applied to all the samples. Disperse, homogenize and mix biological tissues (cells, animal and vegetal tissues) in pharmaceutical samples, cosmetics and food products. Refrigerated thermostats can be used to keep any product at a constant temperature. For those applications where the monitoring of the sample is extremely important, incubators offer the possibility of visually examining the contents without interfering with the thermal cycle in progress. Magnetic stirrers specially designed for chemical, biotechnological, pharmaceutical, microbiological and medical applications such as growing microorganisms, dissolving nutrients and solids and preventing suspended matter from settling during titration. Hot plate stirrers are widely used instruments for numerous applications. Aluminum or ceramic tops offer different performance, single-place or multi-place, different stirring capacities and speeds: numerous solutions to solve your problems! The temperature set on the heating magnetic stirrer / heating plate might not correspond to the temperature of the sample. Verify the temperature of your sample in a quick and easy way! Elemental Analysis is a process where a sample of a compound is analyzed to determine its elemental composition in a wide range of sample matrices with accuracy and precision. The most common form of elemental analysis is accomplished by combustion analysis. Nitrogen is one of the most commonly occurring elements in nature. Its determination has a long history in the area of analytical chemistry and a wide range of application, including food and feed, environmental, chemical and pharmaceutical samples. In a food and feed product, the estimation of nitrogen gives the protein content when multiplied by a factor, then the total protein content can be determined. Kjeldahl and Dumas are the two official methods for nitrogen analysis. The environmental risk represented by trace metals is due to their toxicity but also to the possible bio-concentration that can reach human beings through the food chain. Turbidity is one of the most commonly used parameters for determining the quality of water. The turbidity value is an important factor in various fields of application such as drinking water, disinfection processes, industrial processes and water treatment plants. Radiation detection is an important parameter to be studied in the environmental field.